I have eaten at Green Street Grill at least once a month for the past four years. I’ve been there with all types of people- parents, friends, boyfriends, colleagues- and none of my guests has ever had a bad word to say about it. 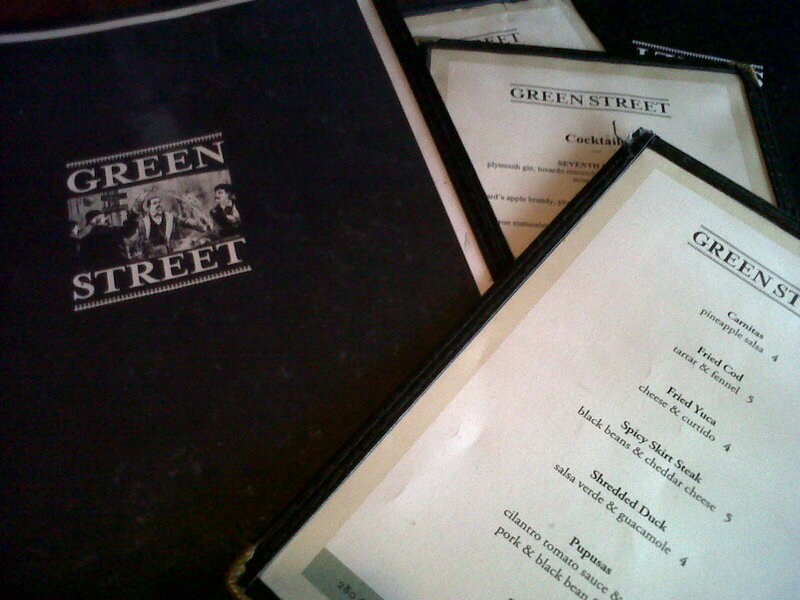 I had one of my top twenty favorite meals ever at Green Street on my 29th birthday. The staff is lovely. The atmosphere is low key with a mix of funk and mild sophistocation. The cocktails are potent, the wine list is solid, and the food is great. So why doesn’t anyone ever talk about this place? Don’t get me wrong- I love knowing that I can get a table. I love knowing I can usually get “my” table (upstairs by the window, a seat perfect for SB and whichever FoSB is joining that day). I’m just not sure why Green Street remains relatively undiscovered. I get it, Green Street. You have a bit of a complex. You think, hey, I’m not that great, pay me no mind. You live in noisy, dusty Central Square, not some fancy Boston neighborhood, and you are a little envious of trendier places. Maybe your parents never told you that you were pretty, or your ex-girlfriend left you for someone taller or with more hair. You’re comfortable being quietly awesome in your own right, but you feel like if you brag about yourself, you will only disappoint. Well, sign yourself up for some therapy, Green Street, because you deserve better. After just one of your Jack Rose cocktails the stress of my day completely melts away. After two of them the memory of my last name starts to fade. Sweet, tart and perfectly chilled, I would corral the unwashed denizens of Central Square and teach them all to sing for this drink. Honestly Green Street, its ok with me if you want to remain in the background. Its just that I love you so much I want everyone to know how great you are. However, I’m perfectly happy continuing to introduce the city to you, one FoSB at a time.